To watch the sledge ice hockey league match and act as a goal judge to assist the referee. You will be positioned off the ice near the goal so do not need to be able to skate. No previous experience is required. One of the highlight events in Cardiff to celebrate being the European Capital City Of Sport for 2014. The event sees the best young athletes from the home nations compete head to head in all the athletic disciplines. Volunteers will be required to perform a variety of tasks including Team Attaché, medal ceremony bearers, runners for scorers and kit. – Help with the set-up and close-down of the venue by setting up and packing away branding. Supporting a coach delivering a basic tennis session for 10-20 disabled children within a mainstream tennis event. Sport Cardiff in association with the WRU are pleased to be organising an atomic touch tournament for girls in year’s 7 and 8. Atomic Touch takes elements of touch, rugby, netball and basketball to create a new game to suit everyone! It’s an exciting game, very fast and dynamic which is easy to start. Volunteer roles will vary from refereeing to time keeping and scoring or general supporting duties to ensure the competiton runs smoothly. Be part of the largest football festival this year for girls and boys from Cardiff’s Primary Schools. It’s a 4v4 tournament to celebrate a successful year of football as part of the European Capital City of Sport 2014. This year promises to be extra special with the presence of the UEFA Super Cup trophy!! To highlight Cardiff as the European Capital of Sport 2014, Sport Cardiff in association with the Welsh FA are making all competitions and events as prestigious as possible. 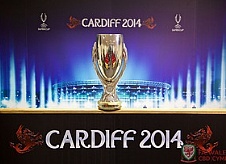 Volunteers will have the chance to have photos with the trophy before it takes pride of place at the UEFA Super Cup final held at Cardiff City FC Stadium on August 12th 2014. Volunteers are needed to help oversee the smooth running of the games, including team support, preparing equippment, and helping coordinate fixtures.